Floral Centerpieces & Table Décor | Collections Etc. It doesn’t matter if you’re looking for the perfect affordable tabletop centerpieces for a wedding or if you’re after a festive topper for your holiday table setting, Collections Etc.’s elegant flower decorations will help you beautify your home without breaking the bank. We have a wide range of seasonal centerpieces as well as beautiful, year-round arrangements that you can display every day or just for special occasions. We have an inspiring variety of dining room table centerpieces designed specifically for adding an elegant, enchanting or romantic feel to the dining room. Explore a great selection of lighted table centerpieces featuring glowing LED lights and flameless candles for setting a mood at your dinner parties. We even have unique tabletop tree centerpieces featuring gorgeous faux branches and colorful textures for an arrangement that feels upscale yet natural. In fact, many of our customers use our tabletop trees for weddings and other extra-special events where the wow-factor is required! Not only do we have picture-perfect dining table centerpieces to create a unique focal point in everyone’s favorite gathering space, but we also have floral décor that can be peppered about your entire home in our home floral arrangements section. Complement your living room, office or even the kitchen with faux floral arrangements featuring lifelike cherry blossoms, succulents, roses, poinsettias, hydrangeas, greenery and more. These gorgeous faux flower decorations bring an elegance and charm no matter where they’re placed, and the best part is they come at a great value so you don’t have to compromise. 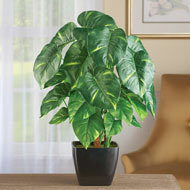 With realistic details, this faux pothos plant is a great way to add greenery to your home, maintenance-free. 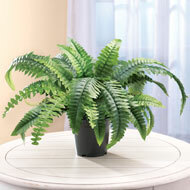 The foliage is "planted" in a stylish black vase that matches any décor. Polyester and plastic. 5"Sq. 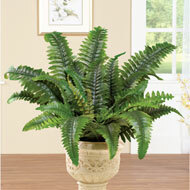 base x 19"H.
With realistic details, this faux fern is a great way to add greenery to your home – maintenance-free! 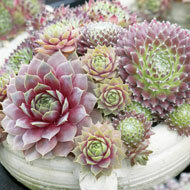 The delicate foliage is "planted" in a black pot. Polyester and plastic. Pot measures 5"Dia., plant is approx. 13"H.